I’m a SharePoint guy, and certainly no PowerShell expert. I know enough PowerShell to get things done in SharePoint from time to time. I can often go months without using PowerShell and talking to colleagues I don’t think I’m alone in the SharePoint community. So if you are just starting out with using PowerShell to do something with SharePoint, or it’s been a while and you need a refresher on the basics then you’ve come to the right place. Before we get started I’m writing this article based on SharePoint 2013 running on a Windows 2012 server. 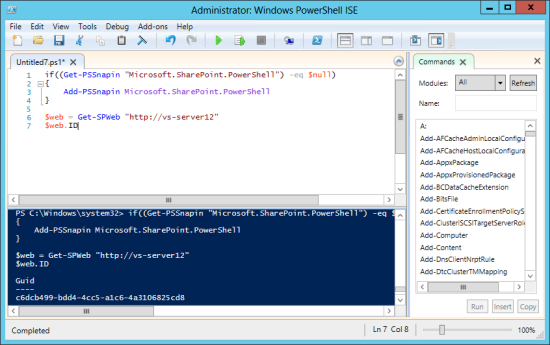 It is possible to run PowerShell against a remote SharePoint server rather than on the server itself, but it requires some setup on the SharePoint server side and let’s face it, it’s not basic. If you need to do it you need to be searching for “Remote PowerShell in SharePoint”. PowerShell needs to be executed/run at a PowerShell Console or PowerShell Window – this window looks like a standard Command Line window and I don’t find it too inviting. 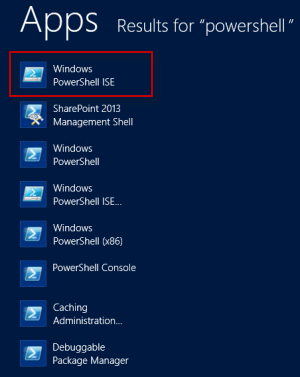 Instead of the SharePoint 2013 Management Shell, I use the Windows PowerShell ISE. Why? It’s like comparing Visual Studio with Notepad. The ISE is an environment for developing PowerShell scripts that gives you nice syntax highlighting, debug with breakpoints, intellisense and more. It’s more like a development environment than a command line. I think you’d agree it looks slightly more advanced. When using the “SharePoint 2013 Management Shell” (the ugly black one) it automatically loads a “snapin” which is basically a PowerShell extension that gives you a series of commands for working with SharePoint objects. When you use the Windows PowerShell ISE it has no idea of SharePoint, so you need to load the SharePoint snapin manually. The simplest way to do this is just to add the following code snippet to the start of all your scripts. Windows PowerShell ISE will have trouble running a script if you haven’t saved it to disk yet. PowerShell scripts are saved as files with a .ps1 extension. Here’s a reference of all the SharePoint 2013 PowerShell Cmdlets you can use to work with SharePoint. You can now start cutting and pasting examples from the internet and modifying them to work with your environment. The following 2 lines get a handle on the SharePoint website at the URL http://vs-server12 and then output the ID of the website. To run the script and see if it work, click the Run button. Any output from running your script is shown in the output window below the script editor. Get-PSSnapin : No Windows PowerShell snap-ins matching the pattern “Microsoft.SharePoint.PowerShell” were found. You’ve ignored ground rule 4 and the pre-flight checklist by forgetting to save your script before running it (yes, I still do this too). Posted on June 18, 2014, in PowerShell, SharePoint and tagged Basic, Beginner, Guide, how to, Introduction, PowerShell ISE, Script, sharepoint, SharePoint Server. Bookmark the permalink. 9 Comments. Hi, I’m on Windows 2012 but am running SharePoint 2010, is it possible to use Powershell or will I have to upgrade to SP2013? I didn’t ignore rule 4 and saved my file. I get an error message when running the SnapIn code. 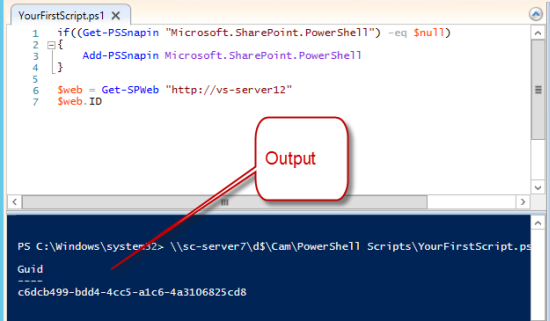 Are you running tue PowerShell on the SharePoint server? The error indicates the necessary dll file (which should be present on the SharePoint server) could not be found. Hi, How can I manage SharePoint related Powershell script from remote desktop. is it possible. above solutions works only on server. I haven’t tried doing remote Powershell. There is a fair bit of information on the internet for doing it but I think those are mostly just the SharePoint Admin Powershell scripts. As a novel alternative have a look at this article, it shows how to use the SharePoint Browser (free tool for remotely accessing SharePoint) and it has some remote Powershell capability build in. this system. For more information, see about_Execution_Policies at http://go.microsoft.com/fwlink/?LinkID=135170.